Since its inception, content on Twitter has largely been displayed in the same basic manner. That is a linear, reverse chronological stream of Tweets. Two new sections being added to the service are about to change that. Specifically, the “@Mentions” tab on twitter.com is being replaced by two new tabs: “@USERNAME” and “Activity”. These two streams will add an additional layer to Twitter and to Tweets themselves, a layer showing the social activity around them. The @USERNAME (obviously, USERNAME will be replaced by your Twitter name) stream will still show your @replies, but it will also show things like when someone follows you, when someone favorites one of your Tweets, when someone retweets one of your Tweets, or when someone adds you to a list. 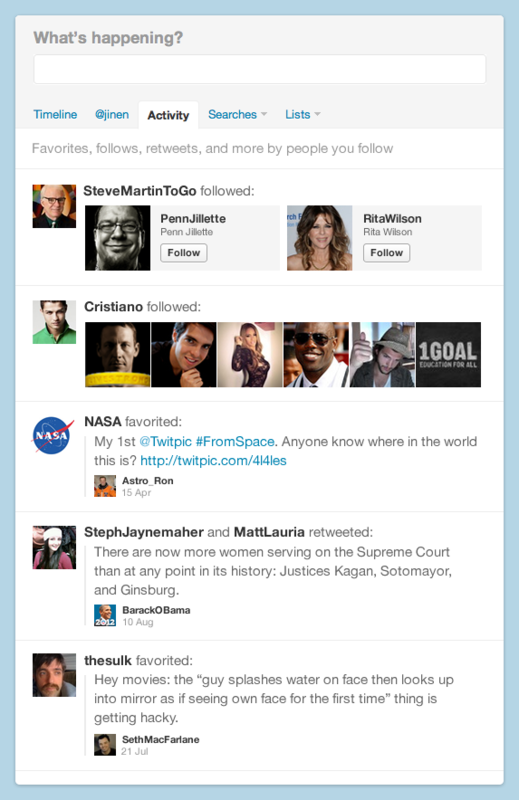 The Activity stream will show you all of those things, but related to all of the people you follow on Twitter. In other words, you can see if a connection has retweeted a Tweet, or if they followed someone new, etc. If you’re familiar with Instagram, this dual activity stream is similar to the concept they use to highlight happenings on the service beyond photos being shared in the main stream. All of this information flows into these two new Twitter streams in realtime. And the key is that you can do activities like reply, retweet, and most importantly for Twitter, follow, right from within these streams. That’s the key to this change: this is yet another move by Twitter to bulk up their social graph. And it’s a smart one because it will make Twitter feel more alive. At the same time, they’re keeping the main stream intact as the simple, standard reverse chronological stream. The mixing of @replies with other activity will probably piss some users off — most people hate change, after all — but overall it’s a smart move. This change could significantly alter Twitter usage in one other way as well. While Favoriting Tweets is just about as old as Twitter itself, it’s a feature that has always been under-represented and under-utilized. That’s because Twitter never gave it a defined purpose, and more importantly, never had a good way of showing how others were using it. Now they’re giving the feature the latter exposure. It seems that most people have used the Favorite button throughout the years to either bookmark something or to actually mark their favorite Tweets. This lead to the rise of services like Favstar. 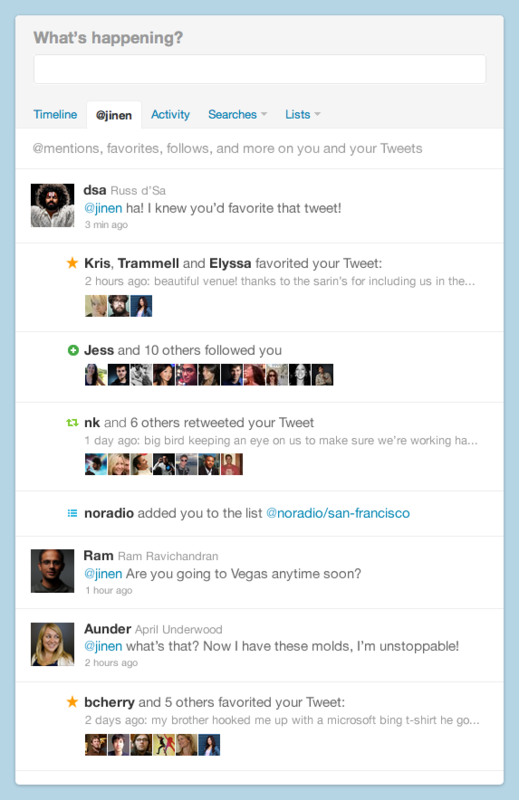 With the recent addition of Favorite email notifications, Favoriting finally gained some Twitter social juice. Now these new activity streams should jack up the usage of the Favorite as a way to show someone you appreciate their Tweet — a “like” button, if you will. Twitter will begin rolling out these changes to a very small set of users today. The rollout will continue over the next several weeks, assuming everything goes to plan. Again, this will only be on twitter.com for now — Twitter is thinking about how to surface this same information on their mobile applications, but notes that it could be different for different devices.